When I write or speak about utility communications, I tend to focus on the “message” part of the communications process, i.e., which words should be used and which ones should be avoided in order to achieve a desired result. Like this post. And this post. 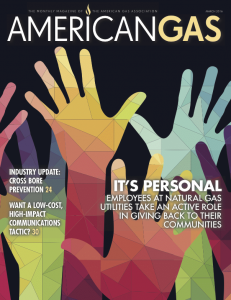 Last month, when I spoke at the American Public Power Association’s National Conference, I focused on messengers, and I learned a lot. I started my talk by reducing the communications process to its most elemental pieces, “message” and “messenger.” At a high level, everything about communications fits into one of those bins. 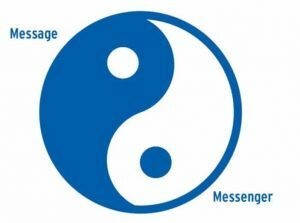 Like the two interdependent pieces of the yin yang symbol (above),“message” and “messenger” fit together to form a whole. They can’t exist on their own. They gain strength from the other. Think about it. A bad message can’t be effective regardless of the delivery system you select. And a bad message-delivery system will undermine even the best message. In speaking to the APPA audience, my co-panelists and I focused on the messenger, specifically how utility retirees, employees and members of the community could be effective messengers for points a utility may want to make. The degree to which these messengers would succeed depended on their credibility and the quality or believability of the message. The midpoint of the continuum, “One-to-Many,” refers to Speakers Bureaus (sometimes called something else), where utility employees would be trained to respond to speaking requests the utility might receive from the local Chamber of Commerce, schools, or community groups like the Elk’s, Rotary or Lion’s clubs. These groups might want to know about environmental protection, jobs, future construction projects, new price options, recent power outages, etc. The idea of “one-to-many” is that one person can be an effective representative when speaking to numerous people. 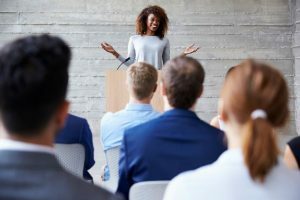 Participants may or may not work in a utility’s Communications, Community Relations or Regulatory Affairs departments, but they typically do receive public-speaking training before going out to speak on the utility’s behalf. Communications Tip of the Month: Utility communicators have a variety of tools at their disposal, but if you don’t have a Speaker’s Bureau, you’re at least one hammer light. Before I discussed the other end of the continuum, One-to-One communications, I asked the audience how many had a Speaker’s Bureau. Less than 10% of the audience raised their hand. That surprised me, particularly for an audience composed of leaders at locally owned electric utilities. Most public power utilities (and electric cooperatives) say their mission is to improve the quality of life in the communities they serve. What better way to stay abreast of the concerns of those communities than to participate in civic life through club memberships? Although there may be some towns and communities too small to support Lion’s, Elk’s and Rotary club chapters, I can’t think of a community that doesn’t have enough residents to sustain at least one of those service organizations. And towns, cities and counties typically have a Chamber of Commerce. It may be shared across several geographic boundaries, but it does exist. And schools? They’re in nearly every single community. How about environmental organizations, neighborhood associations or “concerned citizen” groups? They, too, are everywhere. I left that session thinking utilities of all stripes were leaving a lot on the table if they didn’t have a Speaker’s Bureau. Particularly now, as the industry is going through so many changes, it is vital that utilities find ways to get their views heard in their communities and by their customers. Speakers Bureaus are not the only tool in a communicator’s toolkit. But a toolkit missing a Speakers Bureau is at least one hammer light. Well, maybe your experience is different from mine and the experiences of numerous other utility communicators. But most people I speak with say the “come to our headquarters” approach is problematic at best. Cowlitz PUD’s Speakers Bureau has worked out very well for that utility, and it’s not alone in that regard. 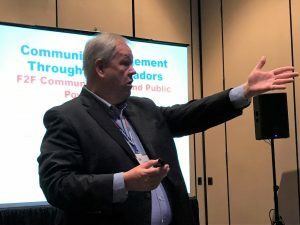 If you’re wondering about the effectiveness of your utility communications channels, if you have come to the conclusion that social media is great, but only for certain types of communications (like outage alerts), if showing the flag is long overdue, maybe it’s time to consider (or reconsider) creating a Speakers Bureau. If you need help setting up a one-to-many communications program, call me. Let’s have a good old fashioned one-to-one conversation about getting your word out. Have you tried to mobilize your retired employees as an adjunct communications and marketing resource? Few utilities have. But one utility, Louisville Gas & Electric, has been mobilizing its retirees for over 20 years. Find out how LG&E is benefitting and what it learned along the way.